Home › Blog Topics › Shopping for Ideas! 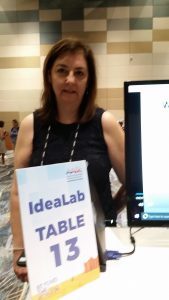 The Idea Lab held on Thursday, November 9, from 1:00-3:00 pm, was a true mall of ideas where AASL National Conference attendees shopped for innovative ideas and best practices. This shopping venue has history. Beginning as the Exploratorium in 2005, the now aptly name IdeaLab evolved with each conference. This year’s version has 26 exhibits ranging from green screening to STEM classroom and library activities to low-tech/no-tech makerspaces; and school librarian shoppers eagerly crowded around exhibitors sharing their ideas. 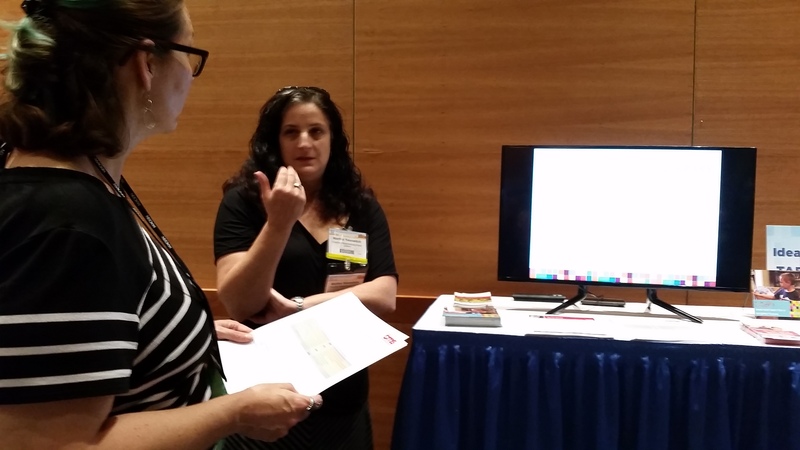 Translated as “Welcome to the School Library,” Diane Wendell, school library system director at Orange-Ulster BOCES in central New York state, at table 13 shared information about how her workshops and other services provide support for school librarians serving English language learners (ELL). Chances are that most school librarians serve ELLs in their school libraries. The National Center for Educational Statistics reports that for 2014-2015, 9.1 percent of public school students were English language learners with 77.1 percent speaking Spanish followed by Arabic, Chinese, and Vietnamese being the next most prevalent languages (NCES). According to Diane, “We have an upcoming workshop on “English as New Language (ENL) and the Secondary School Library Program.” In addition the Orange-Ulster BOCES School Library System has created a webpage with links to databases and websites for students learning English. We are beginning support for a supplemental collection development program whereby school librarians can use local funds to purchase specialized collections that will be available within the region via Interlibrary Loan. We have future plans to sponsor a Multicultural/ELL Book Fair for the region’s schools and workshops for elementary school librarians” (Wendell). For more information, check out the Orange-Ulster BOCES School Library System website. At table 25, Martha Yesovitch touted the successful Charlotte-Mecklenburg School and Public Library “ONE Access” collaboration, a public-school library partnership to increase access to resources. The name “One number equals access” means that K-12 grade students can use their school ID numbers to borrow public library resources and access databases (Charlotte-Mecklenburg). Martha, the public library educational partnerships manager, sees great benefits to students, stating “One of the strongest successes of ONE Access is its effect on equal access to information across the socio-economic spectrum. Students in all areas of Charlotte, even those known to be ‘book deserts’ or ‘food deserts’ have used their ONE Access accounts to interact with the library. Our circulation of non-fiction ebooks for middle grade students has skyrocketed more than 110% since the beginning of the initiative. Use of the Tumblebooks resource for PreK-2 students has increased over tenfold. Students are empowered not only to do research online but also to check out physical materials since the barrier of overdue fines has been removed. ONE Access has opened a world of information to over 150,000 students” (Yesowitch). For AASL National Conference attendees, the IdeaLab shopping expedition netted a fistful of plans. From the IdeaLab, conference goers are moving on to the exhibits, sessions, and networking lunches to grab more information before heading home to adapt and implement their dreams. Charlotte-Mecklenburg Public Library. “Supporting Student Success.” https://www.cmlibrary.org/supporting-student-success/ (accessed October September 17, 2017). National Center for Education Statistics. “English Language Learners.” https://nces.ed.gov/fastfacts/display.asp?id=96/. (accessed October 22, 2017). Wendell, Diane. Email to author October 17, 2017. 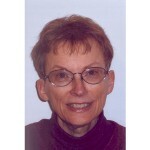 Adams, Helen. Idea Lab photos. November 9, 2017. MacEntee, Sean. 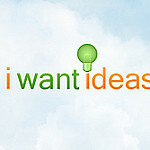 “[I Want] Ideas.” December 2, 2011. Used under Creative Commons Attribution License. https://www.flickr.com/photos/smemon/6442111703/sizes/l (accessed October 27, 2017. Woodward, Amanda Schultz. 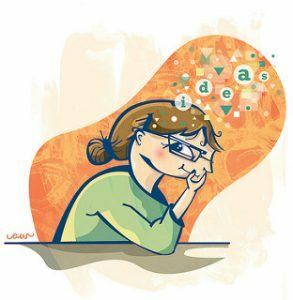 “Ideas.” November 21, 2006. Used under Creative Commons Attribution-Non-Commercial License. https://www.flickr.com/photos/amandawoodward/303024645/sizes/n/ (accessed October 27, 2017.